BIG Big Finish Week: THE NIGHT OF THE TRIFFIDS Review | Warped Factor - Words in the Key of Geek. Hey! Who turned out the lights? asks Tony. Day of the Triffids, by John Wyndham, was a seminal science-fiction apocalypse, in the same league as HG Wells’ War of the Worlds. Taking as its premise the existence of a race of intelligent, walking, communicating plants that were both aggressive and carnivorous, but which humanity had nurtured because of a fantastic oil they produced, and what it would take for such plants to become the new alpha predator on Earth, it was bleak and terrifying in its potential, and it has been rendered on-screen several times (for our money, the 1980s BBC version starring John Duttine is still the creepiest). 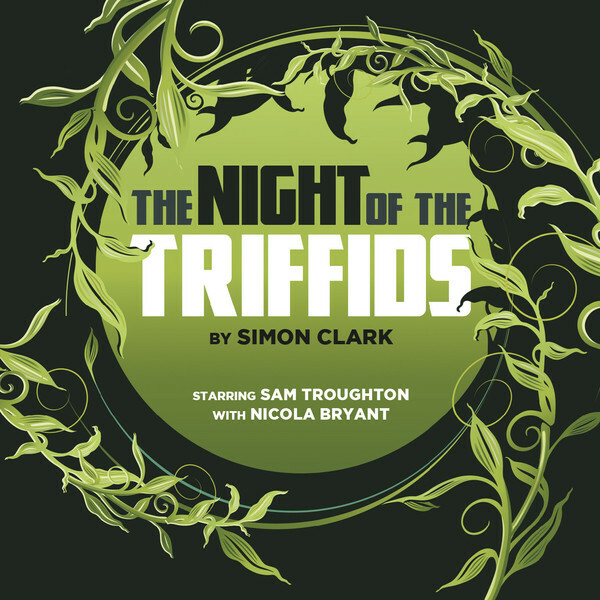 Night of the Triffids, by contrast, is a relatively new sapling in the urban jungle, written by Simon Clark and published in 2001. Rather than revisit the original horror in an audio format, Big Finish chose to show some love to the cutting. So the question is: how far does the poisoned apple fall from the tree? The beginning is a clever inversion – in Day of the Triffids, Bill Masen, worker at a Triffid farm, wakes up one morning to complete darkness and incongruous sounds. In Night of the Triffids, his son David wakes up to complete darkness and incongruous sounds. Essentially the same beginning has very different causes though, and David’s darkness is actual, rather than specific. Where Bill Masen wakes to find he’s one of a relative handful on the people not blind after a meteor shower (or at least a spectacular cosmic light show), David discovers there’s something blocking out the light of the sun. Almost immediately, it becomes clear that the Triffids, previously thought to have been eliminated on the Isle of Wight, are back, and one character makes a rather heavy-handed point – in total darkness, everyone is as good as blind, giving the Triffids an unspeakable advantage once again. Set twenty-five years after the events of Day of the Triffids, Night describes a completely different world in some respects – a world where power groups have re-established, ways of caring for the blind are up and running, and so on. That being the case, the plunging of at least the local world into inexplicable darkness has to make up in threat terms for the overturning of a whole civilisation, and try as it might, it never really exploits enough of the darkness to make that happen. It feels almost like a gimmick for the spearheading of the adventure, given that little else is made of the darkness and practically nothing of the other effects of a blocking out of the sun – the lack of heat, the fdanger to plant life like the Triffids themselves. Masen Junior has adventures, absolutely – he finds a creepy floating ‘raft of the Triffids,’ complete with an unharmed human occupant, which seems to show the Triffids using a form of reasoning, of exploration, and which flirts with the notion of their intelligence. David also discovers a ship from the United States (such as they are), uncovers some ghastly secrets which intersect with his father’s past, and discovers the fate of the States in the wake of the Triffpocalypse. It probably won’t surprise you to learn that in Clark’s vision, America is divided into a Gatsby-esque white, sighted elite with resources the like of which Britain can only dream of, and a dark, unmentioned underclass trampled underfoot. There are eugenics and cloning there, but also, in a somewhat perverse upending of history, there is hope in the South of a better, more unified society, and the potential for a world that allows humans to walk among Triffids without triggering their aggressive stinging instincts. There’s also, for David as there was for Bill, a pathway to love among the Triffids, with Nicola Bryant taking a Peri-break to voice the Baedekker sisters. That depends what you’re looking for. Day of the Triffids was only ever half about the Triffids in any case; the real horror in the story was a world gone blind, and a civilisation instantly plunged into chaos and anarchy as a result. Really, the Triffids were just the smoking gun in the thing – useful as an additional trouble to have to negotiate and a way of providing moments of deep, sudden shock. In Night of the Triffids, we don’t have that plunging of the familiar world into chaos to contend with, but it would be fair to say the Triffids are still not centre stage in the drama. They’re there, and there’s more of a direct focus on dealing with them, rather than just running away to safety from them, but really speaking the main drama in Night of the Triffids comes through neither the sudden, all-encompassing night, nor the Triffids, but from the way Clark envisions a restructured American society would look, and the struggle to bring it down. So if you’re listening to Night of the Triffids thinking ‘Ooh, finally, a proper Triffidfest!’ you’re in for a let-down. That said, there’s something inherently fascinating about rejoining such an apocalyptic story as Day of the Triffids two and a half decades after its events, hearing how society has survived and structured itself – and what the nature of that restructuring can show us about what’s lurking under the surface of our own civilisation. It’ll come as a surprise only to the blinkered or the blissful that Clark’s American Utopia comes at what might be fair to call a Trumpian or Cameronian price – non-whites and people with disabilities have a place in the world of Night of the Triffids; it’s just not a place you want to find yourself. The Big Finish version of the story gives David Masen an agreeable young voice in Sam Troughton, and allows Bryant to expand the kind of role she’s known for by the majority of BF fans, especially as she plays three sisters, with three very distinct personalities. There are certainly some creepy moments too: the raft of the Triffids is a goodie, and there’s a degree of sickening inevitability when you find out the truth about post-Triffid New York and the principles on which it’s built. Paul Clayton makes for an acceptable but never an entirely scary Big Bad as General Fielding – there’s a sense that Fielding is just filling a niche that if not for him, some other douchebag would have filled, that our society is the real bad guy for establishing the lines by which Fielding could come to power. And while there’s certainly a lot of ground to cover, by the time David’s escaping from the glitzy side of Manhattan, you begin to wonder how much more of the story there is to come. Quite a lot more being the answer, the release trading to some extent on the magical, terrifying idea of the Triffids to engender patience in the listener. Ultimately, there’s something irresistible about Night of the Triffids to a fan of the Wyndham original, because we’ve probably all spun the story on in our minds, so it’s great to hear a kind of ‘official’ version of the post-Triffid future. Troughton and Bryant do good work to sustain the story despite several unexpected twists and turns, and listen out for Jeff Francis as Gabriel too – he helps connect the middle and later stages of the adventure. Ultimately though, while Day of the Triffids got away with its relative lack of full-on Triffid terror by turning human beings in desperate circumstances into the true monsters, Night of the Triffids at Big Finish still doesn’t deliver the all-out Triffidfest you’re looking for, and substitutes a kind of slave revolt for the collapse of civilisation, with perhaps not as much success as was hoped for. It feels…interesting, more than ultimately successful, and it leaves the listener waiting for the third and final instalment of the Triffid saga, where the scattered remains of human society learn to overcome the Triffids and take back their planet, having hopefully learned the lesson of not enslaving either distinctly or potentially sentient creatures for their own uses.